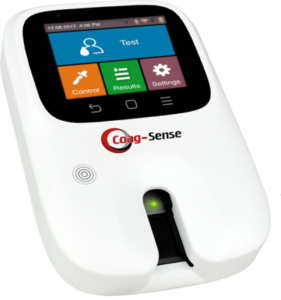 We are proud to announce the release of the Newest device on the market for Point of Care PT/INR testing, the Coag-Sense PT2 meter. With the same direct clot technology as the original Coag-Sense meter, the new PT2 meter has a Smaller design and Advanced Technology including Wi-Fi, Bluetooth®, Near Field Connectivity (NFC) and a color touch screen to control it all. The Coag-Sense® Prothrombin Time (PT)/INR Monitoring System is the first system with direct clot detection technology. Thanks to its micro-mechanical detection process it offers superb accuracy and precision, it is also not susceptible to changes in Hemoglobin & Hematocrit levels and it has the ability to run whole blood or plasma sample. This simplistic approach to PT/INR testing has delivered a stellar safety history since its introduction. PT/INR testing has not made many new advancements in recent years, until now with the release of the Coag-Sense Next Generation PT2 meter. Key differences between PT1 and the NEW PT2 meter are listed below for your reference. We are offering a new customer PROMO STARTER PACK which will include 4 boxes of test strips and the Next Generation PT2 meter at a discounted price. Contact your local Stat Technologies territory manager for more information or to schedule a complimentary 20 minute webinar to learn more.